KATHMANDU, Nov 23: Nepal is the second richest country in the world in water resources. This is a statement that most of the Nepali people know by heart. And yet,most of them don't know where the water is. 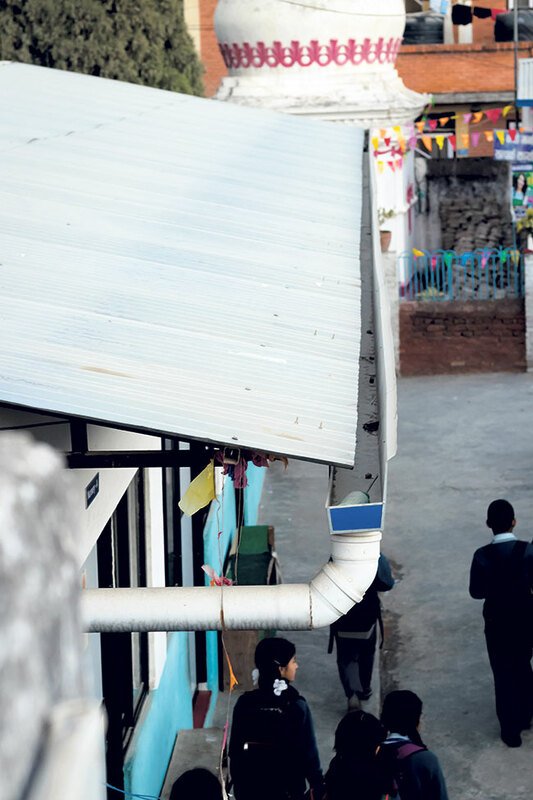 Drinking water is a scarce commodity, even for the residents of Kathmandu Metropolis. Not everybody has access to water that is supplied through the government pipes. They have to spend thousands of Rupees each month in buying water from private tankers, and wait forever for the ‘Melamchi dream’ to come true. In rural areas of the country, the situation is worse. People have to travel miles to fetch a bucket of water. But there is a glimmer of hope – in rainwater harvesting. We often see people in water-scarce areas collecting rainwater in buckets outside their houses, which they use for cleaning and washing purposes. And if used properly at a larger scale, rainwater can be a huge help to address our water woes. The simple and affordable technology of rainwater harvesting has been put to use in various countries around the world as a way out from water scarcity. There are various organizations working in this regard across the globe. We also have one of such organizations in Nepal, an NGO named Guthi, which is working in the field of rainwater harvesting. Guthi, in coordination with International Rainwater Harvesting Alliance (IRHA), State of Canton, City of Canton, and City of Meyrin, is running a campaign named ‘Rain Community’. The campaign includes awareness sessions, trainings, and setting up of rainwater harvest systems. The organization recently held three-day-long awareness campaign in two public schools of the Kathmandu valley. “Through the campaign, on the first day we reached out to a total of 903 students of grade 1 to 10 from Viswa Niketan Secondary School, Teku. We divided the kids into different groups and involved them in small group projects about rainwater harvest. We held a speech competition for the students to talk about the importance of rainwater harvesting, sanitation and importance of toilet. On the second day, we inaugurated a new RWH system in Ganesh Bhukampa Panarsthapana Kendra at Liwali, Bhaktapur. And on the third day we visited Jana Prabhat School, Kalimati,for a program similar to that of VNSS,” said Bimala Gurung, Project Coordinator for Rain Community. Under the campaign, they also monitored the conditions of people living in slums, particularly of Bansighat, and how they managed water problems. Photographers Hilaneh Mahmoudi and Murat Pulat, who had come to Nepal on IRHA’s recommendation, said, “We are here to document IRHA’s work and see how proper water supply changes the lives of people. The roofs of the school have corrugated zinc plates tilted at an angle. The water that hits the roof gets collected in a drainage system fitted with pipes. Rainwater of the first 10-15 minutes is discarded in order to avoid any kind of contamination. This is known as the ‘First Flush’.After that, the pipe’s outlet needs to get blocked so that water can get collected in a 200-liter drum through the pipes. The drum is layered with sandand gravel, also known as ‘Rapid Sand Filter’, where the water goes through a purification process. Then the purified water travels to an underground storage tank with a capacity of 50,000 liters. 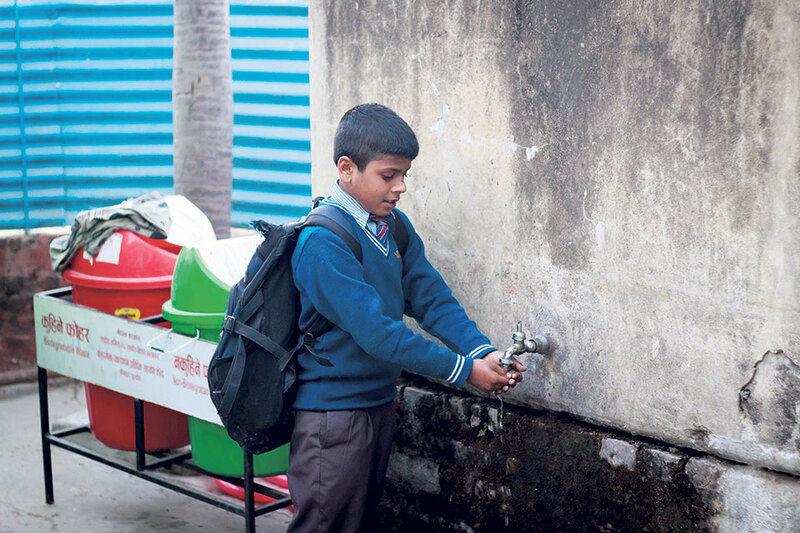 The water then gets used in the taps around the school premises around the year. The tank also provides water to the nearby well and keeps it recharged. Rainwater harvesting does not necessarily need roofs to collect water. You can also set up the system where rainwater hits the most,such as an open surface. Then you just need a collection system and a drainage system for the water to flow through and get collected somewhere, maybe a reservoir or a tank. Setting up these systems in the schools took about Rs 1.5-1.8 millions in investment. But to set up the system in a household will cost much less. One can benefit from the system for about Rs 20,000-30,000.